In this photo editing tutorial, we'll learn how to quickly correct overall tonal problems in an image using the Levels adjustment in Photoshop. In a previous tutorial, we looked at how to fix both tone and color cast problems at once using the Levels command, but a more common first step in a good photo editing workflow is to simply correct any tonal problems, brightening highlights, darkening shadows and adjusting the midtones, leaving any needed color corrections for later steps. As we'll see, the Levels adjustment makes tonal correction so fast and easy, you'll be turning dull, lifeless images into ones that seem to pop right off the screen in a matter of seconds. And unlike the Brightness/Contrast adjustment in Photoshop CS3 and higher which doesn't give you a great deal of control and relies mainly on your own personal opinion of what looks good, the Levels adjustment is what the pros use for accurate, professional quality results. The photo is looking a little flat and dull, so I'm going to view the image histogram to see if I can spot the problem. The fastest way to view the histogram is in the Histogram palette which you'll find grouped in with the Navigator and Info palettes. By default, the Histogram palette is set to Compact View mode, which only displays 100 brightness values in the histogram, not enough for serious image editing. You'll want to click on the menu icon in the top right corner of the palette and select Expanded View from the list, which displays the full 256 brightness values. Also, make sure the Channel option above the histogram is set to RGB. The Histogram palette showing that the shadows and highlights could both use a boost. 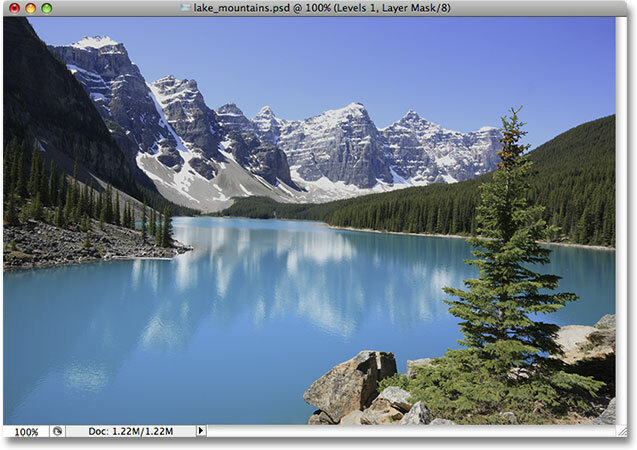 Click on the New Adjustment Layer icon in the Layers palette and select Levels from the list. This brings up the Levels dialog box, with its most noticeable feature being the histogram in the center. The histogram found in the Levels command is the exact same histogram we saw a moment ago in the Histogram palette. The difference is that with the Histogram palette, all we can do is look at the histogram to see where the problems are. With Levels, not only can we see the problems, we can do something about them! The arrows show where the left and right edges of the histogram line up with the gradient. The three sliders below the histogram allow us to adjust the black point (left slider), white point (right slider) and midtones (middle slider) in the image. Drag the black point slider to the left edge of the histogram to set a new black point. The shadow areas in the image now appear darker, improving image contrast. The Histogram palette updates to show the changes we made in the Levels dialog box. The left edge of the histogram now extends all the way to the left, letting us know that we now have deep, dark shadows in our image thanks to our new black point. But notice also that the histogram suddenly seems to be missing sections, creating a comb-like effect. That's because we only have a set amount of image information in the photo to work with and by darkening the shadows, we've essentially spread out and stretched the image information like an accordion or a slinky. Those missing sections mean we no longer have any image detail at those brightness levels, but there's no need to worry because we haven't lost enough detail yet to make it noticeable. The unfortunate reality with photo editing is that with every edit we make to an image, we damage it in some way. All we can do is hope that the "damaged" version we end up with looks better to us than the original "undamaged" version did. We still have a problem with the highlights, so we'll fix that next. Drag the white point slider to the right edge of the histogram to set a new white point. Both the shadows and highlights in the image have now been corrected. The histogram now stretches from left to right, although some brightness levels have been lost. As a side note, if you've been wondering why my histogram is showing a tall spike near the right edge, it's because this particular photo that I'm working with consists mainly of a light blue lake and a light blue sky. In other words, it's made up mostly of light blue, which means the majority of the pixels in the image have a similar brightness value. Since the histogram shows us a comparison of the various brightness levels in the image, having so many pixels sharing a similar brightness value is causing that level to tower over the others. All photos are different, and if you're following along with your own image, your histogram will undoubtedly look different from mine. At this point, we've successfully lightened our shadows and brightened our highlights and the image is looking much better. However, one problem you may run into after adjusting the black and white levels is that the overall image can still appear either too bright or too dark. To fix that, we simply need to adjust the midtone slider. Dragging the midtone slider towards the left will brighten the image in the midtones, while dragging it towards the right will darken the midtones. It's important to note that the midtone slider does not affect the black or white points. Only the brightness levels between black and white are affected. Drag the midtone slider towards the left to lighten the midtones or the right to darken them. The histogram now shows less information remaining in the highlights than in the shadows after darkening the midtones. And there we have it! That's how easy it is to correct overall tonal problems in an image with Levels in Photoshop! Check out our Photo Retouching section for more Photoshop image editing tutorials!